Yum, Portobello Veggie Fajitas! I’ve been feeling rather lazy in the kitchen, so this simple recipe is really doing it for me right now. There is something so satisfying about these Portobello Veggie Fajitas. They take only 30 minutes to prepare including the guacamole and look so pretty too. Eat the rainbow! I love creating meals with colorful ingredients so these Portobello Veggie Fajitas were a blast to make! The bell peppers and onion lend a fun flavor profile to the hearty portobellos and the guacamole adds a cold, creamy dollop of deliciousness and a bright burst of green. Trim the spores from the portobello caps and cut them into large strips. In a large skillet, heat 1/2 tablespoon cooking oil over medium high heat. Add the sliced onion and sauté for 1-2 minutes, until the onion becomes slightly translucent. Add the garlic and cook for another minute, stirring often. Add the zucchini and bell peppers to the skillet. Sprinkle the cumin, chili powder, and 1 teaspoon sea salt onto the veggies and stir until evenly coated. Sauté for 1-2 minutes, then add the portobello strips. Cook for another 5-7 minutes. Gently stir, being careful not to break apart the portobello strips. Meanwhile, mash the avocados in a medium sized bowl. Stir in the pico de gallo and 1/2 teaspoon sea salt. In a separate pan, warm the tortillas over medium heat for 10 seconds on each side. Spread a large dollop of guacamole on a warm tortilla, followed by a generous portion of portobellos and peppers. 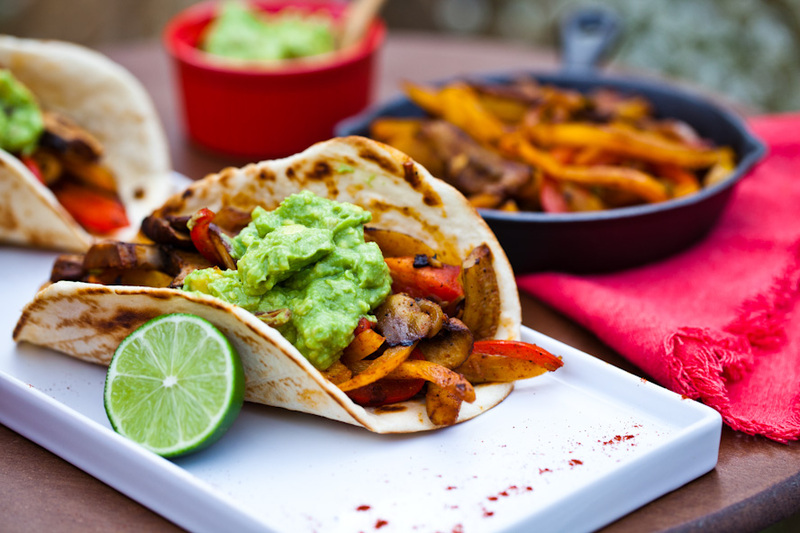 Finish your Portobello Veggie Fajitas with a squeeze of lime and enjoy! My favorite thing about these Portobello Veggie Fajitas is that they are really filling but won’t leave you feeling super stuffed. They taste even better when eaten al fresco so go outside and enjoy them on a warm, summer night! If you enjoyed our Portobello Veggie Fajitas recipe, be sure to check out our Vegan Green Enchiladas or our Vegan Mole Enchiladas. For those who don’t use oil, it is easy to dry saute the veggies or even roast them. It does save me calories and saturated fat, so I find that what I miss from the oil sautéed veggies is worth giving up for my health…but that’s just what I do, and many use oils sparingly and are very healthy and skim. It just doesn’t work that way for me with heart problems. I just made these for dinner and I thoroughly enjoyed them. I think I had more than my fair share. Even my non-vegan family members loved them. Thank you! We will definitely be trying more of your recipes.